When given the distinct and privileged opportunity to cater for The Studio's showings, the wonderful journey that is the planning, preparation, and creative process is very nearly as intrinsically awarding as the execution a la minute the night of the opening. When Claire and Erin first came to me to discuss their first showing, and more concisely their vision for the studio, my first reaction was to question "What are you serving for food?" In essence, we quickly came to a consensus that a comprehensive showing and offering based in collaboration, immersion, and open, accessible dialogue was paramount. That is; red grapes, cheese squares, Franzia, and a multi-pack of crackers simply isn't gonna cut it. It is of my belief that people always gravitate towards the food, towards the kitchen, towards the drink, towards the bar -- to the simple and universally shared necessities. Whether it is Thanksgiving at Aunt Rita's, the company water cooler, or the line for PBR's and cheddar cubes at an art opening, we find comfort in these instinctual staples and shared pleasures. In short, the objective was not to overlook the opportunity to broaden the conversation. The food and drink is to be an extension on the work of the artist or artists displayed, fostering an ability to use our comfortable gathering space to focus the dialogue on why we are here. Guerrilla Smiles Catering is often given advanced viewing of the works and curatorial process, in addition to being privileged to discuss and collaborate with the artists -- to again reinforce the energy and message this choice group of creatives and intellectuals provide. What I hope to provide in this forum of conversation is the creative process in which Guerrilla Smiles' interaction and introspection with these works and artists manifests itself into its comestible form; In summation: How much does a rack of lamb, 3 reusable bags of Stanley's produce, and 6 cases of Stella Artois weigh? ... enough to break the ice. Distribution by Matt Taber to me was an undertaking of vivid passion, immersive technique, deft inception and/or deception, and recomposition. Let me iterate that my interpretations, feelings or inspirations of these works is not meant to in anyway be perceived as an academic or legitimized art criticism, but merely an admirer and cook's take translated in to a culinary format; hopefully resonating and reinforcing the artist's message in our ingestible, tangible form. Perhaps for some it is hard to remember The Studio as not only a gallery and a place of communal artistic gathering, but also, as a studio. A place where art is practiced, studied, or performed. Often Guerrillas Smiles utilizes the humble kitchen at 1020 Marshfield to do just that. Filling the space with manifold aromatics for special events on and off site, salon dinners, art openings, or just a simple meal to fill our friends' and families' bellies. Whether it is the stirring cabin fever, the mayoral fervor, or just the powers that be, there is an undeniable force of productivity and progress in the air for Chicagoans at this moment. I don't think there is a person who knows Matt that wouldn't attest to his elevated work ethic and dedication to his craft in this vein. Dusk or dawn, day or night, it seemed as though anytime I was cooking till the wee hours Matt was somehow in actuality dwarfing it. Needless to say, in addition to the inspiration drawn from Taber's physical works on the walls (and ceiling), his physical work left just as much to be admired. Not to be too literal with my ascertainment, but often (usually) the most obvious, pedestrian observations are the jumping-off points for Guerrilla Smiles' creative thought in menu development. After all, our involvement from its inception is based on the idea of us borrowing a bit of the artists' thunder and being the best Morgan Freeman (supporting actor) we can. 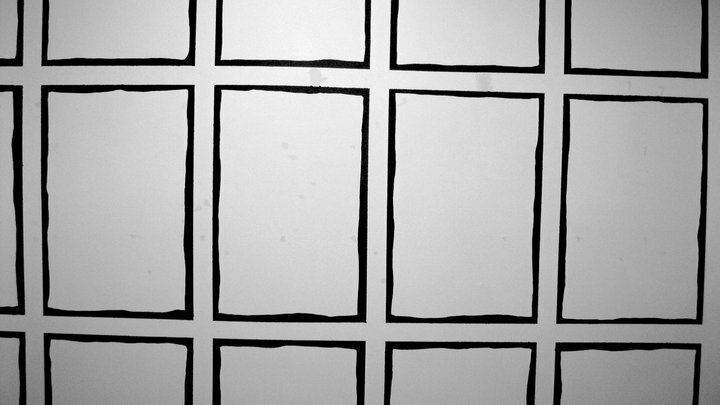 At first glance: rectangles with black and white, abundance, minimalism, repetition, familiarity, recomposition. Again, usually sticking to more simplistic starting points such as shape and color allow us to play around with the finer details. That isn't to be said that the more obscure impressions aren't left to well thought interpretation. For instance, some would say that simplicity implies an implicit Italian or Japanese culinary mindset, while refined and complex technique might invoke French or Japanese practices. Connections such as these are always brought to our attention. Taken a bit deeper than a historically established cultural grouping, there are the seemingly more pertinent social and economic motivations brought to light. The social aspect, specifically in our culinary vacuum, brings to thought the ideas of the contemporary locavore movement in addition to the more traditional shared agape babe elements of food in general. Economics being the vibrance of our company, our brand, our vision, and perhaps more grounded in the realities of our budget or conscientious outlook in the diet of our actual neighborhood and community. In brainstorming sessions, I really liked the idea of trying to literally mimic the works on the walls. At a surprisingly close-to-empty Charleston, on a night when a veritable jazz super group of Charles Rumback, Jason Stein, and Jeff Parker were playing, additional inspiration wasn't short in supply. The music breathed simple, organic brilliance and clarity, the all black walls illuminated by Edison-era light bulbs with visible waves of coils. During a short intermission between the sets, my business partner, Eric, oft collaborator, Derek, and I began listing off every food we could think of that was black or close to it. Sesame seeds, coffee, overripe bananas, tea, burnt toast, fat choy, soy sauce, vinegar, anything burnt, etc. Essentially at this point it was decided we were to "paint" and texturize some sort of black or dark matter on top of a white "canvas." I could see Rumback finish his bourbon and motion his colleagues towards the playing area. I sat back again, swilling around thoughts in my head, soaking in the undulating waves of warm, beautiful sound. I remembered one of Eric's friends, Jordyn (a great cook herself), one time mentioning in passing a Bacon Jam, and even forwarding a recipe. When I thought about anything "burnt" or charred images of summer's sweet sweet caramelized onions immediately came to mind doused in dark beer, that and well cooked bacon. I went back and couldn't find the recipe Jordyn had given me, but undoubtedly after giving it glance some of it had stuck in my subconscious. I did a bit of interweb research and came upon quite a few quality resources, and lots of different iterations of how Bacon Jam is to be made. It seemed as though the idea originated in Texas (suprise), and was in essence breakfast blended and spread on buttered toast. I would like to digress for a moment to mention that American low-cuisine unfairly gets a bad rap. Regardless of its processing, our new classics are based on big flavors, balanced. A Chicago hot dog has acidic vinegary mustard, sweet atomic relish, citrus tomato slice, savory beef, bright crunchy dill, spicy white onions. The argument against ketchup in this mix is a rational, valid one. There is plenty of sweetness in the fresh tomato, atomic green relish, and the hot link itself (4th ingredient is Corn Syrup). The great visionary Catalan Chef, Ferran Adria, is noted in a similar observation. Paraphrased: Big salty burger with creamy accents of cheese and sauce, crunchy lettuce, savory fries, all washed down with carbonated sugar beverage. That is a balanced dish. Bacon Jam = Breakfast blended. It makes sense when looked at similarly in the aforementioned American way. Coffee, grade B dark maple syrup, bacon, onions, garlic; that's pretty much breakfast. I wanted to skew the dish a little bit into the Tex/Mex category and also get a bit deeper color and flavor profile. Ancho chiles to me have an almost indescribable pigment, almost like a dark fish's scales or the glistening fat on roast beef. Sometimes deep umber, violet tinges with hints of Chianti or dark chocolate. Their flavor could almost be described in the same way, with a mild heat level that really allows the dried pepper to sing sharply. Along with a bit of pure shaved cacao for a bit of a more opaque appearance and creamy mouthfeel this would just about complete the jam. The only thing missing from breakfast was the unctuous quality usually provided by eggs. I am a total sucker for anything with an egg on top; I would hypothesize on average I eat about 2 a day. Fried, scrambled, poached, on toast, on a burger, on a pizza, in a basket, you name it I want that in my mouth. One of the the local little mercados (market) in my Ukrainian Village neighborhood is owned by a wonderful man named Amal. There are a bunch of these Middle-Eastern-American owned shops on Chicago Ave -- ranging from dollar stores peddling Chinese merchandise, to discount knock-off clothing stores, to Israeli textile salesmen, to these little mercados. These guys moved in here long ago, when tolerance and understanding was even less than it is now, mugging wasn't a story worth telling, and the word condo wasn't in the neighborhood vernacular. They are a tough bunch, a dedicated, hardworking class of shrewd business owners. Their stocked shelves change as the neighborhood changes -- these stores, this property, paved in old-fashioned hard work and adaptability, will be passed down to their children and their children's children. Amal has 2 employees. A married Ecuadorian couple who work Monday through Friday. They are allowed to leave to pick up their kids from school and bring them to the store; there is about an hour or two overlay between the couple swapping shifts. The kids diligently do their homework and color books behind the counter, usually munching on some delicious smelling snack. The store closes at 8 so the family has a bit more time together before the ninos are tucked into bed. Amal makes more than enough to get by, heck he even works the weekends at the store to give this family the quality time he never had with this children. He speaks better Spanish than a lot of the people in Los Angeles, and his market used to sell more Mexican items, but the store two doors down in Mexican owned. You wont find Yucca bread there, or homemade sofrito, or frozen humitas. Most importantly, which was the point of this long winded vignette, Quail eggs. Boiled quail eggs are an Ecuadorian street food staple. They are great raw or lightly cooked, a traditional accompaniment to beef tartare. They are like chicken eggs reduced to 1/3 the size and triple the flavor. That being said, Amal couldn't order me enough quail eggs to cater for Distribution, and yolk is yellow, not the desired white or black. I think fish and seafood in general has a similar unctuous quality to eggs, which many can find off putting. Seafood is something of a rarer commodity here in Chicago, and for me has always been more of a treat than a daily meal. Isaacson & Stein, located on the fringe of the Fulton Market area is the fish market. They've been in business for over 50 years, and not much has changed over that time. Fresh fish is flown in overnight from around the globe and displayed with no frills on a bed of ice. You package your pick of the seafood yourself in triple gauge clear plastic bags. One or two mongers weighs out your fish, adds it up on an adding machine (yes an adding machine, and don't worry they know the market price and what fish you chose), then hands you a ticket which you then bring to one or two warehouse windows to settle up. I chose a couple wonderful looking Flukes, and had them scaled and fileted for me. I knew I wanted fluke crudo for a couple of reasons. Firstly, fluke (or flounder) has white flesh. Secondly, it usually has a fairly sweet taste; the rich olive oil works well to accentuate this. Thirdly the last piece of this dish is "Fat Choy." A black sea-moss, usually eaten around Chinese New Year (the year of the Rabbit started on the 3rd of this month), which draws traces to good fortune and riches. This is almost always found dried here, and it took me 3 differerent Chinatown trips to find it. The fat choy will be reconstituted in lemon juice, then flash fried to crisp it up and finish the crudo. Last year, when catering for Scott Nadeau's opening reception for Dark Water Soup, I asked my friend, and oft collaborator, Vanessa to create her rendition of a dark water soup to serve alongside mine. She navigated this challenge in a clever, smart, and thought-provoking manner. Her soup was a broth made of black tea leaves, ever so delicately seasoned. The flavor notes she picked out of the tea she materialized as accompaniments or salpicon to be added to the hot broth; a dark-chocolate pretzel, a fresh blackberry. My rendition was more of a hit you over the head with flavor and braised beef black soy broth. Both were delicious, and in many ways I thought she had easily outdone me. Vanessa's dark water soup was the inspiration for the blackberry tea jam. There isn't a whole lot of tea amongst the berries, but it's there. I wanted the journey to be similar to the veiled blackberry undertone she so poignantly picked out the tea, but reversed. Again, hopefully reinforcing Taber's ideas of recomposition and deception. We wanted the theme of color as well as flavor to be balanced and even through out all of our offerings. It is of my opinion that when at a gallery opening, people in general just want a beer (perhaps that is just my projected desire). Black&Tans draw a clear comparison to Distribution's separated tones. We took the opportunity to reinforce this idea of good fortune introduced by the Fat Choy and selected a mild Slovakian pilsner: Golden Pheasant. The importer is located in Chicago which helped offset some of the cost, and decrease our carbon footprint. More importantly the honey tasting malt pairs well with the "Black" half of the pair (Guinness), and the blackberry jam. "Big, round and creamy. Vanilla frosting, kirsch cordial cherries and puffy chocolate nougat dominate the cup while the acidity shyly plays a support role. The finish lingers pleasantly like a delicious cognac." It's not hard to picture the taste of this in your mouth dancing with Disaronno and light cream. Catering for The Studio is always a distinct and unique pleasure. A journey of growth and ideas together with the artist, the artwork, and the space. I truly hope you enjoy the offerings we have prepared for you, and more importantly that it serves to broaden the dialogue of the art of Matt Taber you see on the walls today, and the art you see around you ever day. I am honored and humbled to be a part of, and collaborate with the immense, young, and emerging talent I continue to see here with every visit. I hope that by sharing with you a bit of Guerrilla Smiles' creative process, it serves to highlight how inspiring the work we have seen here are. Hopefully the next time we chat it'll be warm enough, so that we won't have to break the ice. At this point in your life of civility, this should feel natural. You are in a gambol that does not terminate, but supersedes the environment hanging at the doorway with its production. Each surface, medium, and gesture fires an association through the network of monochrome. This particular manner of transmission becomes familiar. The negation becomes a kind of renewal, and the work undergoes a rapid meiosis.You stand in the collision of a binary, not between walls, but between the extremes of sensibility and the search for information. Grains of wood, borders of black, puppets, cats, miscellany...You, as viewer, are offered an insignia of authority. Your presence is necessary to complete the equation. You are the sign of equivalence that activates the images on your right and the images on your left... or rather, contains them, making their active distribution possible. You may not want this authority. You may wish to relinquish it. There is no escape. You forfeit that option in order to acquire civility. Entering room two, you are no longer positioned as viewer, able to read the signs - but conspirator, committed to inhabit the sign. Your garnered position of authority, as you attempt to escape, can not so easily be relinquished. Instead, all freedom of choice is relinquished. The white frames that once individuated each image (and therefore offered the possibility of selection) have dissolved into the walls, and with them, one similarly experiences a certain sense of dissolution. Bodies and information are captured, and forced to confront themselves and process their reconciliation. What remains of the sign, repositions itself with a new sense of authority, the authority that once seemed to be yours. Captivating the space in which you are now contained, the sign obtains what has always been its most functional aspect... the ability to direct, to distribute through space the inhabitors of space. The production then of any individual sign within a space finds its ultimate satisfaction in becoming a part of the fabric of space... transforming itself from distributed, to distributor. How much is the logic of individuality entrenched within the logic of selection, the logic of capital, and at what point does the individuality of people, of objects, lose their sensibility? Free victuals and libations, because life can never be too disorienting!